Bed & Breakfast as Original Art. This award-winning inn is located in a quiet area with views of the red rock formations that have made Sedona famous. There are six unique theme guestrooms with private balconies, Jacuzzi baths, fireplaces, TV/VCRs and CD players. Beautiful southwest tiles, sculptures and paintings by local artists add to the beauty of the inn. 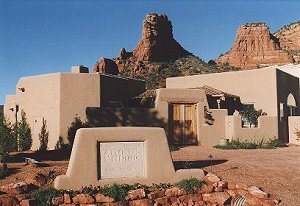 In 1997 the owners added Adobe Village, four luxurious 850 sq. ft. casitas around a beautiful brick paved courtyard. Each Santa Fe style adobe casita has a waterfall shower, two fireplaces, double Jacuzzi, and kitchenette with bread maker, allowing guests to check in to the aroma of fresh baked bread. The beautifully landscaped grounds with pool, spa, and fountain invite you to enjoy the outdoors. Bicycles are available. Guests experience comfortable elegance and memorable breakfasts. AAA Four Diamond Award. Find a Special Place in Your Heart at Adobe Village & The Graham Inn. Romantic Country Inns, Getaways and B&Bs offer a great Sedona lodging alternative to big hotels.